Locally owned businesses build strong communities by sustaining our historic town centers and linking neighbors. Local businesses are owned by people who live here, work here, and are more invested in our future, because they directly feel the impact of our decisions. Locally owned businesses create more jobs locally, offer greater loyalty to their employees, and in most sectors provide better wages and benefits than chains do. Where we shop, where we eat and hang out—all of it makes our neighborhood home. In an increasingly homogenized world, communities that preserve their one-of-a-kind businesses and distinct character have an economic advantage. If we wanted to live somewhere that looked like everywhere else, we wouldn’t be living in McNairy County. Locals competed for $300 in local gift cards. Participating meant posting a photo shopping at local establishments with #ShopMcNairy in the caption. Hundreds of locals participated in this campaign. Locals LIKED & SHARED the Local Pledge to enter for a chance at a $50 gas card to a local gas station. The pledge promised to shop, spend, enjoy, eat, volunteer and donate local. Hundreds participated. ​Locals hunted Waldo in local businesses. 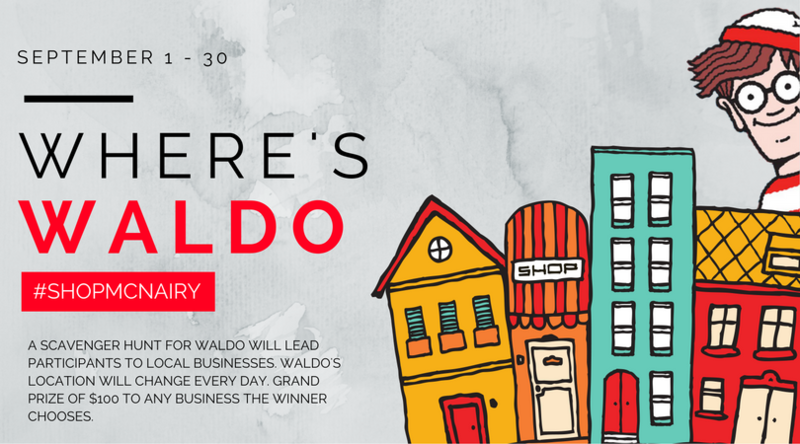 Waldo riddles were released each day on the Chamber Facebook event page. One local won $100 to the McNairy County business of their choice. The McNairy County Chamber of Commerce will be hosting a #ShopMcNairy Fashion Show on Monday, November 14th from 6:00 - 8:00pm at the Latta Building. The Fashion Show will be a preview of Small Business Saturday merchandise. All McNairy County boutiques and clothing retail within the county are welcome to participate. Contact the Chamber office at 731-645-6360 if your store is interested in participating or email katie@mcnairy.com. The Chamber will award one $100 gift card as a door prize at the event. Join us for an evening of food, fashion, and fun, McNairy County style. #ShopMcNairy y'all. Lunch Mobs will be informal come and go lunch gatherings (11:30am - 1:00pm) at McNairy County member businesses throughout the month of March. Those in attendance pay for their own meal but are eligible for a special offer (must mention Chamber Lunch Mob) at each restaurant. This is an initiative to #ShopMcNairy and eat local, plus it's is a fun activity that focuses on connecting members. Lunch Mobs will be a boost to the business that gets a lunchtime rush thanks to the support of locals, may even introduce new customers to a restaurant. The month of April will be dedicated to Dinner Mobs (5:30-7:00pm) with the same informal come and go style as lunch but later in the evening for some of our restaurants. Those in attendance pay for their own meal but are eligible for a special offer (must mention Chamber Dinner Mob) at each restaurant. Enter to win $300 in local gift cards by shopping local July 1 - August 1, 2017 in McNairy County. Entries will not be limited, each photo counts as an entry. One winner will be announced on Tuesday, August 1, 2017. Happy Shopping! The Fashion Show will be a preview of Small Business Saturday merchandise. Contact the Chamber office at 731-645-6360 or email katie@mcnairy.com if your business is interested in participating. ​Tickets are now on sale. General admission $20 or a table of 8 can be purchased for $150. Dinner will be catered.